It starts with a company’s instruction “don’t be evil” and ends with a monopolistic marauding giant, taking content without asking, invading people’s privacy, using regulatory capture to quash rivals and demolishing entire industries with its big commercial hammer. 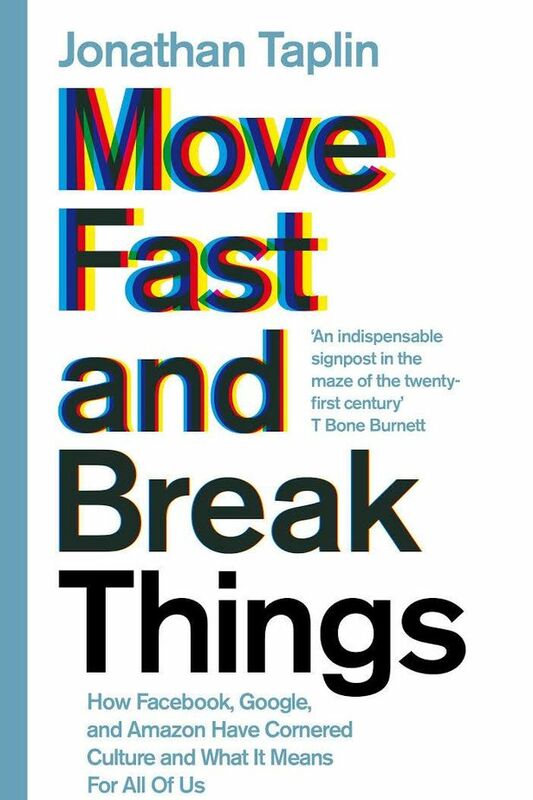 Jonathan Taplin has spent a lifetime in the media – producing films, promoting bands, launching streaming services – and he surveys the scorched cultural landscape in his new book Move Fast And Break Things (Mark Zuckerberg’s famous dictum). There he sees the predatory practices of monopolies like Amazon , Facebook, Google and, to a lesser extent, Apple go unchecked with creatives such as musicians, writers and artists stripped of livelihoods with irreparable damage done not only to the wage-packets of individuals but the march of civilisation itself. He notes, in a broad and well-researched study, that the billionaire entrepreneurs do not start out evil, nor do they necessarily end up there. The mission creep of capitalism demands they re-shape their outlook until they are unrecognisable to their former selves. Nudge by nudge they go from benevolent disruptors to the worst kind of cookie-cutter predators, destroying for the sake of destroying, still convinced of their social mission. But Taplin also sees the invisible hand of the libertarians providing philosophical cover for their ventures, embodied by PayPal billionaire Peter Thiel , the man who funded the destruction of Gawker, the website that outed him as gay. The libertarians have a long history of resisting anything that impedes their march towards absolute self monarchy. Taxes, copyright, social obligations, government interference – all must defeated. And the techno-monopolists are a perfect vehicle. The hypocrisy is bold and blatant – other people’s copyright is anathema to a free market but our patents are sacrosanct. All this has happened with such a speed that fumbling democracies, susceptible to persuasion and glamour, have failed to keep pace. Indeed, they have been suckered by the new wave entrepreneurs. So President Bill Clinton’s “safe harbour” provisions in the Digital Millennium Copyright Act opened the floodgates for wholesale pillaging of people’s livelihoods. It’s now the nerds who take your lunch money. Taplin does provide a solution to the monopolies, sufficiently radical for the nature of the times. It involves open patents, stronger copyrights, a return to the de-centralised web and grass roots co-operatives. If YouTube can use its dominance to give away all music free, living off the ad revenue – goes the thinking – why not give musicians access to the technology to see if they can do the same. And we’d get more music. Disruptive antitrust measures are required to smash the monopolies otherwise Taplin points to a world with technology triumphant over democracy, liberal economies and social order. In the face of the scale of this upheaval, there are only a handful, like Taplin, who care to see it coming. The rest of us are eyes down and checked-out – giddied only by the prospect of a new thing blipping across our screens.